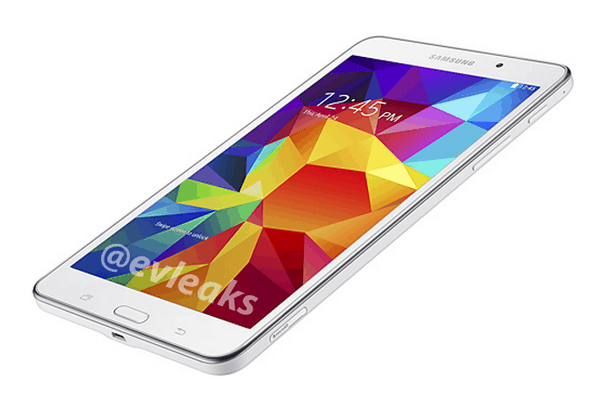 Samsung's next planned leak of their new Android tablets happened right on schedule yesterday. The ever reliable @evleaks posted a couple product images yesterday, and they reveal that Samsung's newest 7 inch tablet is going to look pretty much identical to last year's model. Previous leaks of the specs for this tablet suggest that it will only be a slight upgrade on last year's model. It will likely be getting a bump in screen resolution (to 1280 x 800), and it will run Android 4.4 KitKat on a quad-core 1.2GHz SnapDragon 401 CPU. It's getting a slightly larger battery and will support 64GB microSD cards, but other than that the Tab 4 7.0 will probably have the same 1GB RAM, 8GB Flash storage, 1.3MP and 3MP cameras, and other specs found on last year's model. There will reportedly be Wifi, LTE, and 3G versions of the Samsung galaxy Tab 4 7.0, but at this point none of the models have cleared the FCC. While I don't have the real spec sheet to look at, the specs mentioned above are based on a concatenation of specs posted by a source that had previously proven reliable and leaked benchmarks for Samsung's not yet released Galaxy Tab 4 8" and 10.1" models. I'm willing to bet that they are correct because the pattern of leaks fits with past Samsung marketing efforts. Speaking of the benchmarks, you might have noticed that it looks like Samsung will be using the same resolution screen and largely the same guts in all 3 of their Tab 4 tablets. I'm guessing that this is a cost saving measure both in terms of production and for developing new firmwares. Rather than customize Android for 3 CPUs and 3 screen resolutions, Samsung will only need to develop a firmware for 1 CPU and 1 screen resolution. That could save them some work. Of course, Samsung tends to not release firmware updates, so I don't think this matters much but one can hope.